With our new Super Tuesday primary, California could decide the 2020 presidential primary, and a new survey of Californians shows broad statewide support for Sanders’ democratic socialist vision. Bernie Sanders describes an America divided in two: the “millionaires and billionaires” who want an ever greater share of wealth for themselves, and everyone else – the diverse members of the working class who have to make do with less and less. 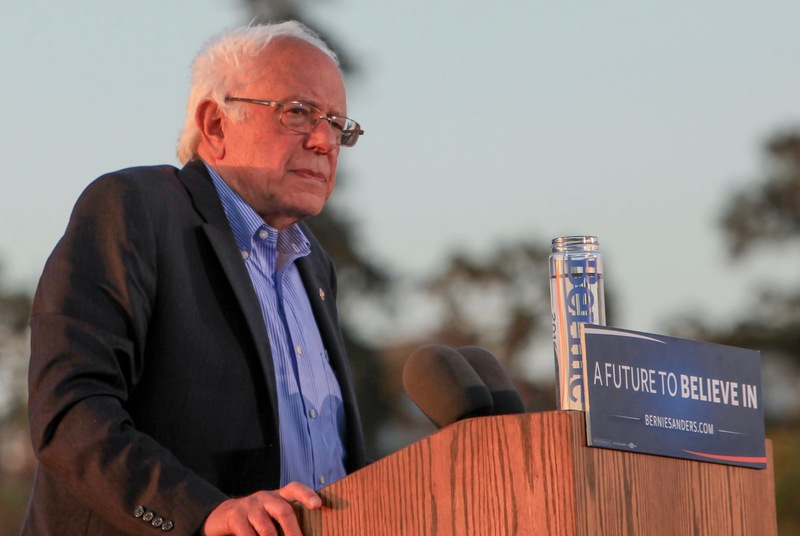 It’s very likely that in early 2019, Sanders will declare his candidacy for president. The results of a new statewide survey of Californians’ political views show that broad majorities of Californians across race and gender lines are ready for his class-war message, and a change in the timing of our primary means that we help could deliver the Democratic nomination to Bernie. California used to hold its presidential primary in June, long after most of the votes in the primary had been cast and the winner virtually already decided. In 2020, we’ll vote in March, alongside New Hampshire and Iowa. Because California has a huge number of voters and Democratic party delegates, the move to March changes a California victory, representing 16% of total votes in the Party’s primary, from an afterthought to a necessity for candidates. In a crowded field, an early win in California will deliver a huge — and potentially insurmountable — early advantage in the race. The Public Policy Institute of California (PPIC) surveyed Californians just after the midterms last month, and their findings indicate that by a wide majority, Californians of all backgrounds want universal healthcare and tuition-free college, and that most see our society divided into economic “haves” and “have-nots.” All of these indicate a readiness to vote for Sanders’ political vision of a society run for the benefit of the many, not the few. Sixty percent of Californians think universal healthcare coverage, one of Sanders’ signature demands, should be a high or very high political priority. Universal healthcare was the most popular policy among those surveyed, with 81% of Democrats and 61% of independents supporting it, and majorities of all races. The next most popular policy was tuition-free community college, another Sanders signature. Fifty-three percent of Californians were in support, lead by majorities of both Democrats (62%) and independents (53%). When asked if they believed that California is divided into economic “haves” and “have-nots,” two-thirds of all respondents said it is. The idea of a class division of society had broad traction among majorities of Democrats (73% agreed with the framing), independents (69%), and Republicans (60%). A majority of respondents from every race also agreed, with African Americans the most likely to agree that there’s an economic divide (82%) and a majority of Latinos (68%), whites (67%), and Asian Americans (55%) also agreeing. As Matt Karp described in Jacobin, the so-called “blue wave” of the 2018 midterms mostly only occured in House districts ranked as “prosperous” or “comfortable” by the Economic Innovation Group, a bipartisan think tank. As for the “economically distressed” districts across the country, only two of 43 "flipped" in response to Democrats’ tepid and unconvincing support for working people. Sanders is the most popular politician in America, and he appeals to working Americans across lines of age, race, and gender. In the 2016 primary, Sanders won more votes from people under 30 than Clinton and Trump combined, and a majority of young black voters supported him. In a 2017 poll, he was viewed favorably by 57% of Americans, including decisively high approval ratings among women (58% approval), African Americans (73%), Hispanics (68%), and Asian Americans (62%). At our December general membership meeting, East Bay DSA voted to call on Bernie to run for president in 2020 and to form a committee to begin planning for an independent DSA campaign in support his run. The results of the PPIC poll show that California could be prime Bernie country. If DSA organizes around a Sanders candidacy, we can win millions of diverse Californians to socialist politics while putting a democratic socialist into the presidency for the first time in history.